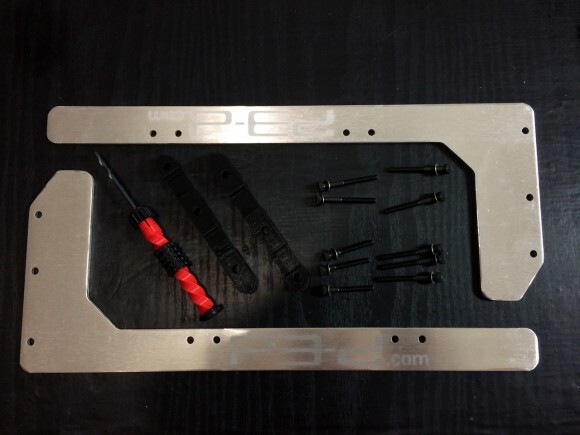 Time for another upgrade to our MakerBot Replicator 2 3D printer, this time we have decided to install aluminum arm stiffeners in order to help eliminate sagging of the build plate and reduce the lateral build plate vibration and movement during printing. The upgrade parts we are installing are the Aluminum Arm Stiffeners from Performance 3-d. The installation kit we got is designed to fit multiple 3D printers and it includes pretty much all things to mount it including screws and a drilling tool that is partly 3D printed. These Aluminum Arm Stiffeners are designed to be fitted as an upgrade on Makerbot Replicator 1, Replicator 2, Replicator 2X, Flashforge Creator, and Wanhao Duplicator 4, Duplicator 4X. The arm stiffeners are relatively easy to install and it should not take a lot of time, then you need to spend some time tweaking things up before finally tightening them – try moving the build platform up and down over the Z axis to make sure that everything is fine. The results after installing the upgrade – less problems with failed or not that good looking 3D prints as with other upgrades that we have already installed, but still we do still have some issues from time to time. In general however after installing each new upgrade to our 3D printer we are getting less and less problems after that, so there is definitely an improvement, either small or big.